I sidle into the dining-room of Luffgate’s finest hotel just as the best man is finishing his speech. My makeshift mini marquee is to the right of the room – I’ll make a dive for it when he sits down. Just as I try to make myself unobtrusive behind a pillar, the best man looks up from his notes, and his eye catches mine. He smiles and I blush – he is incredibly good looking. I peek at the bridesmaids in their dresses of sky blue. Three are smiling at the jokes, but the pretty blonde at the end of the table keeps her eyes down. Her mouth trembles slightly. I wonder if Mr Best Man is her boyfriend – but he’s a good bit older than her. Thirty-five if he’s a day. More likely to be the kilted usher at the next table. He’s looking almost as miserable as blondie, as he looks over at her, trying to catch her eye. It all started at work last year. 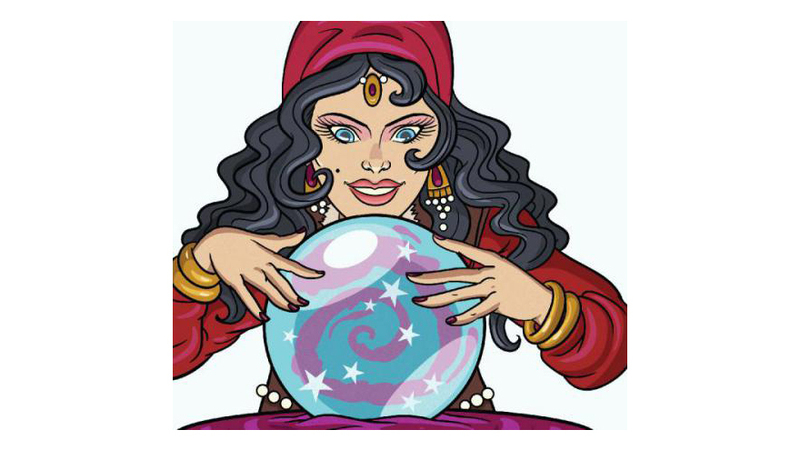 We’d decided to raise money for the local hospice and some bright spark decided that, as well as the usual raffle and cake sale, we should have a fortune teller. “I am not dressing up as a gypsy,” I said firmly. “But you will do it!” Paula clapped her hands and skipped away before I could protest further. So I bought a book about palm-reading and set about practising on my family. All were unimpressed by the fact I could tell them so much about themselves apart from Gran. Turns out Gran was right. I did have a gift. Colleagues flocked to my desk and before I knew it I had agreed to attend a hen party in my guise as Madame Min. From there, my fame spread and soon I was being booked for parties of near strangers. By now I’d got wise and was charging for my services. But I couldn’t help feeling wistful as I told brides-to-be of the happiness that awaited them. My Mr Right had never come along despite the fact, as Gran often reminded me, that I was pushing 30. And now one of those brides has booked me for her wedding. I’ve barely sat down when my first customer slips shyly into the tent. From then on business is brisk. An hour goes by and I’m hoping for a quick comfort break when “blondie” appears. She’s touched up her make-up, and her voice is challenging as she thrusts out her hand. “Can you forecast a happy future for me, Madame Min?” she asks. Intently I study the lines on her plump, fair hands. She’s trying to give nothing away, but her eyes blink rapidly. “I have a man who loves me,” she says, snatching her hand away. She sounds a lot happier now than when I overheard her crying in the loos when I’d first arrived, confiding in her fellow bridesmaid about her selfish pig of a boyfriend. They’d both just finished uni and he wanted them to go travelling for a year. She wanted to settle down –the excitement of her sister’s nuptials had her hearing wedding bells – but he wanted to see the world first. I can’t feel at all bad about my deception – they are obviously made for each other. Great aunt Kitty would be proud. By the end of the night, my queue of clients has dried up. I lean back, exhausted, as I listen to the strains of the last dance. What a surprise when the best man steps inside the tent. I didn’t see that coming! I reach out for his hand, but he takes mine, turning it palm way round. “I foresee a dance, Madame Min,” he says. “And maybe dinner in a few days to thank you for all you’ve done this evening?” He jerks his head towards blondie and her partner and I see a twinkle in his eye. OK, so sometimes I need a little help in foretelling the future. But I’m sure of one thing right now. I am going to dance with him and have dinner with him. As for the future, who knows? Not me, but I’m guessing my happy ending has finally arrived.